The Bay Area Technology School violated state education laws when it required students and their families to purchase uniforms, graduation tickets, and caps and gowns, according to the Oakland Unified School District. All students were made to purchase uniforms from the Oakland charter school only, a violation of the education code. Graduating 8th and 12th graders were made to purchase caps and gowns from the school, and their family members were required to buy $10 tickets to attend the ceremony. These practices went on for several years, according to school staff who asked not to be identified for fear of retaliation. BayTech even warned parents on its website that students would only be allowed to wear BayTech branded jackets, sweaters, and shirts, and that students could face discipline if they didn't don the clothing. The proceeds BayTech collected from these illegal activities amounted to thousands of dollars, said several sources. It's unclear what the school's administration did with the money. In a separate notice of concern sent a week earlier, OUSD officials warned BayTech leaders that they repeatedly violated California's Brown Act, which requires that charter schools provide public access to meetings because they receive public funding. The numerous financial and transparency violations came to light after OUSD announced that it was investigating BayTech for mismanagement. The district's investigation was initiated after BayTech's principal, Hayri Hatipolgu, suddenly resigned at the end of the past school year. Several other senior staff also quit the school, and two board members, Alretta Tolbert and Gina Miller resigned, as well. The sudden departure of the board members and staff have thrown the school into chaos. The three remaining board members, Fatih Dagdelen, Kairat Sabyrov, and Volkan Ulukoylu, are now accusing Hatipoglu of defrauding the school by surreptitiously changing his employment contract to give himself a three-year payout worth hundreds of thousands of dollars if he resigned, instead of a six-month payout worth much less. Hatipoglu has fired back at the three remaining board members by accusing them of being part of a "shady network" that is trying to "take over" BayTech. But since he resigned, the Express has been unable to contact Hatipoglu. Looming over the school's management crisis is its relationship to a larger network of charter schools that were established by followers of Fethullah Gulen, a Turkish imam who has been accused of plotting the 2016 coup against the Turkish government. Gulen resides in Pennsylvania. BayTech's three current board members are all Turkish. When asked at the school's board meeting earlier this week if the school is linked to the Gulen movement, both Dagdelen and Ulukoylu declined to answer. 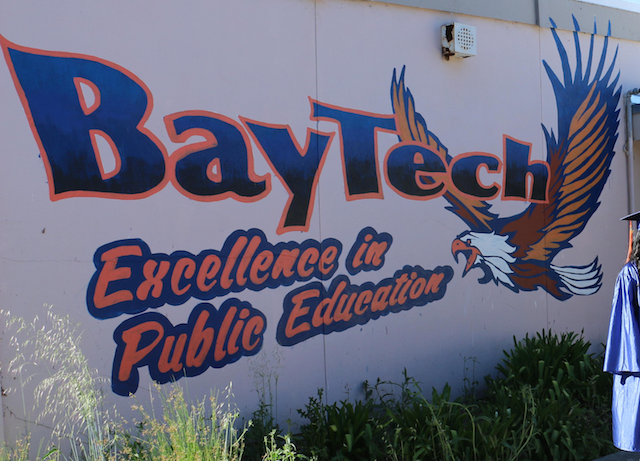 According to OUSD records, the district is reviewing BayTech's finances to see if any money was misappropriated. Hatipoglu's employment contract is also being examined to determine if the allegations against him are true. BayTech's first day of school is August 13 and the school has hired an interim CEO to assist with reconstituting the board and getting the organization's affairs in order. OUSD is also considering appointing a board member to BayTech.